RSX sterring wheel in a 5th gen?? Like the title says, will a steering wheel from a 2002 rsx typeS work in a 5th gen? and if so does anyone have it on there car? Re: RSX sterring wheel in a 5th gen?? I'm not 100% on this but i think it will fit. I think i remember reading about someone doin it on a 5th gen before. You may need to use the entire steering column. I'm at work now but when i get home I'll try to find some info for you. Talk to Brash22 (Colin) i can almost guarantee he'd know. I know they fit, because I've seen it done. As to anything else, I can't help. I always thought it had a dual-stage airbag, but not entirely sure about that. I know the wheel part is almost exactly the same as an S2000 wheel, so you could use an S2k airbag if the RSX one doesn't work (I have a red-stitched Civic Si EP3 wheel with a S2000 airbag in my 5th gen). yea.... also the honda insight (ugly hybrid car) has the same exact wheel as the s2k minus the cruise control buttons. Man does anybody else think swaping parts from these two cars if funny? I only ask because my brother has an 04 RSX typeS, and he wants all Honda emblems on everything, he even wants the steering wheel to have the H emblem, and I want the 06 RSX type S 17" wheels. But seriuosly I havn't seen anything on swapping the steering wheel from the 02 RSX, but I have seen doing an S2000 swap. why swap the steering wheel for a oe steering wheel for another honda? lol bustr wanna trade steering wheels? Why not? I'd love an aftermarket steering wheel for my car, but to fit one without an airbag is against the law here. So the easiest way is to fit another Honda wheel. S2k tillers for example look like they were meant to be in the Prelude. And having driven a car with one fitted they are a nicer wheel to drive with. The steering wheels from the Rsx, ep3, and s2000 all fit the 5th gen preludes. But the only airbag that works is the one from AP1 s2000. This airbag is the only single-stage airbag (the one that works with our preludes) while the rest are dual-stage airbags. Yeah they fit. I would use the AP1 S200 though. Last edited by 00CDMLUDER; 02-26-2009 at 12:08 AM. I don't see RSX ones but I always see s2000 steering wheels in preludes. can someone explain the difference between 1 and 2 stage airbags? Old thread, but man oh man, thats a mouth-full. Thats what she said. I am also interested in fitting a different steering wheel on my lude. If i got a hold of an EP3 redstitched wheel, could i just buy an AP1 s2000 air bag, hook it up and be done? An air bag is definitely not something I wanna skimp on. Ya dig? I'll tell ya man, those EP3 and Type S steering wheels are hard as hell to find for under a bajillion bucks! i was told by JLUDE from pp, that you could buy a single stage airbag for an ep3 steering wheel and it would work. i am very interested in the progress of this little project you have going, lemme know how it goes. 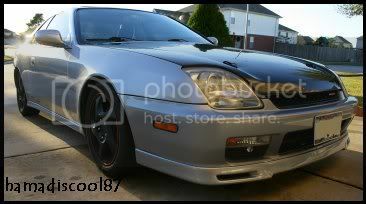 i would love to get a different steering wheel for the lude. any info on the 98 spec SRS ITR wheel? U talking about the DC2 momo srs wheel? I wonder if a NSX type r wheel fits? That wheel, to me, looks a little bland. I'm looking for the red stitching and square, not round (like the s2k), honda badge. And if I got the EP3 airbag, it has a red badge, in which case I'd be obsessive and change all the honda badges on the car to red, which I dont wanna do. So I'm gonna try and look for a redstitched EP3 wheel, with a DC5R airbag. btw, that DC2 wheel is on Ebay for next to nothing. but will it work? will the airbag work with our 5th gens? I don't see why it wouldnt. As long as its a Single stage bag, it will work. In order to put a dual stage on our cars, it takes some modifications. I've seen a DIY on an s2k wheel...looks a little complicated. Once again, air bags is nothing I wanna delve into. yeah no kidding thats why i want one that will just bolt on and plug up with no problems.